Heritage Charts and the Charleston Library Society have just finished cataloguing the Society’s four Volume collection of J. F. W. Des Barres’s ‘Atlantic Neptune’. The collection has been in the Society’s possession for over 200 years but has rarely been seen. The Volumes date from 1777 and are early editions of J.F.W. Des Barres historic publication, with several of the charts, maps and plans contained within dating from as early as 1775 when Des Barres started compiling the surveys of Samuel Holland and his team of surveyors. Many of Des Barres maps were issued as single sheets to British naval officers at the time with bound volumes being reserved for Senior Commanders, and other nobility. Like so many books of this age the bindings of the first three volumes are in need of conservation but on the whole the pages are in good reasonably good condition. 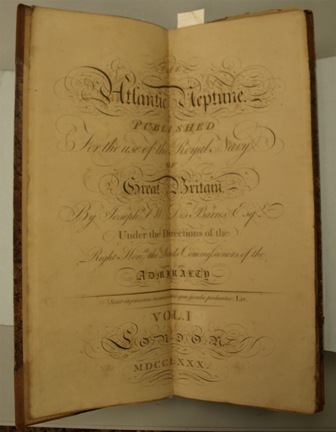 As part of the cataloguing we took the opportunity to cross reference the pages with the Henry Newton Stevens Collection of the Atlantic Neptune held at the National Maritime Museum, Greenwich, London. Quite typically in Atlantic Neptune volumes some of the contents pages do not accurately reflect the order, or even the content of the volumes. This is especially true of the Charleston Library Society (CLS) Volume I. Not all of the charts listed under the Henry Newton Stevens (HNS) collection are present in the CLS volumes. The HNS listing is effectively the ‘dream team’ of Neptune charts and those not present in the CLS volumes have been highlighted. Firstly the National Maritme Museum (NMM) document reference ID in column 3. If this ID is typed into the NMM web-site search engine (http://collections.rmg.co.uk/) the HNS version of the CLS chart will be found. Secondly, every page of the CLS volumes (see column 7 ‘Disc folder..’) have been photographed and are stored on disc and are available for viewing from the Archivist at the Charleston Library Society.